Wastech's engineers understand processes. For example, they can design a skid for a hot water loop, a filtration system, a waste treatment process, or a boiler package. Advantages to the contractor or owner are faster project design, one-party responsibility for execution, higher-quality fabrication, and a complete solution that is assembled and tested at the factory for rapid startup. Sulfuric, and other strong acids, are extremely dangerous to human beings and can cause severe burns, secondary thermal burns, eye damage and are highly corrosive to many metals. Many acids and sulfuric acid specifically are available for purchase in either highly concentrated form or in a diluted form. Substantial cost savings can be acheived by purchasing the highly concentrated acid (96%-98%) and diluting it in-house to the concentration in which it is most often used (20%-50%). However, the process associated with the dilution of strong acids creates an exothermic reaction which leads to the release of heat. This heat may be sufficient enough to boil the acid which can cause toxic aerosol to be released. Wastech Acid Dilution Systems are designed to dilute the acid to a usable concentration in a safe manner. The system incorporates thermoplastic materials compatible with the highly corrosive acid. Each system utilizes corrosion resistant heat exchangers to efficiently remove the heat of reaction so that the temperature of the diluted solution is reduced. 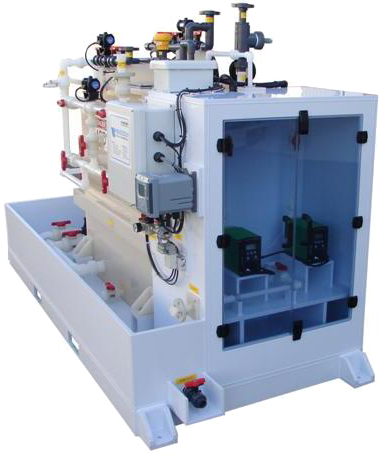 The Wastech system is a compact skid mounted fully automated system requiring no process operator. The system is PLC controlled and is designed with the ability to set the desired final acid concentration and temperature. The reaction tanks are double contained to provide maximum employee safety. 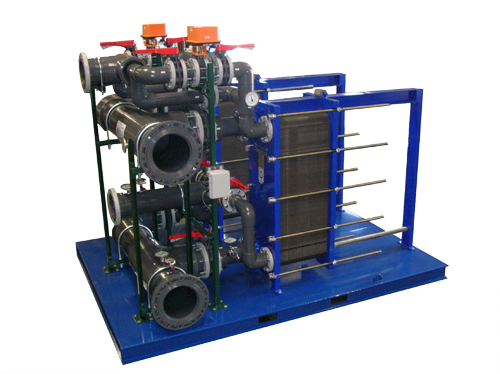 An optional chiller can also be provided on the system skid. Wastech has a full-time staff of chemical, mechanical, electrical and controls engineers standing by to ensure delivery of the safest, most efficient system possible. You can rest assured that your concentrated acid stream will be diluted to the desired concentration in a safe manner. Wastech's Sulfuric Acid Neutralization Systems efficiently neutralize concentrated waste acids and comply with strict water pH discharge requirements. Systems designed for dilute solutions, and for high concentrations of waste acids are available. Neutralizing concentrated acids is considerably more complicated than neutralizing dilute acids, and their system design requires extensive knowledge of chemical processes and experience with analytical instrumentation. Strong waste acids are often highly exothermic when neutralized, and will require heat removal systems. The instrumentation and control strategies used in concentrated acid neutralization systems are more complex than systems for neutralizing dilute acids. Design and fabrication of these systems involves knowledge of the correct application of chemically resistant process equipment to ensure long service life. Wastech offers Sulfuric Acid Neutralization Systems in continuous or batch configurations, and systems can be designed for other inorganic acids of various concentrations as well. Heating and cooling of process fluids can be accomplished in many ways. The details of the design of your heat transfer system will greatly affect its energy efficiency and operating cost. Wastech engineers have many years of experience in designing Heat Transfer Systems. 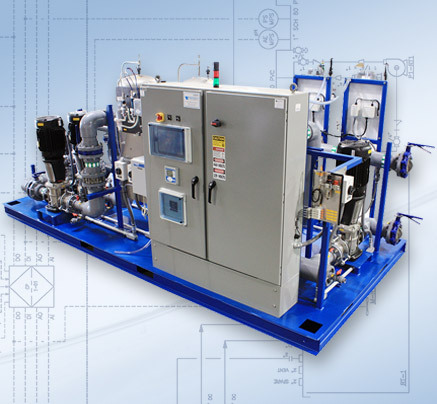 Whether incorporating immersion heat exchangers (coils) into a batch system or utilizing shell-and-tube heat exchangers, Wastech can offer a complete skid mounted heat transfer system solution. Wastech engineers are experienced in utilizing all types of corrosion resistant heat exchangers, including exotic metallic or thermoplastic units. Our experience enables us to select the correct corrosion resistant heat exchanger for your application. In addition, our many years of industrial process control system design enable us to integrate state-of-the-art digital process flow and temperature control into your process monitoring. Our packaged heating and cooling systems can include metallic heat exchangers as well as thermoplastic units fabricated from PVDF, polypropylene and polyethylene. Each system is thermally designed to minimize cost and maximize energy efficiency. Each application is skid mounted with sensors, tanks, pumps, temperature controls and a UL-rated control panel. Applications can be monitored remotely with alarm conditions or locally with an operator interface using a touch screen. Filtration has become an integral part of most industrial processes. It is particularly important in waste treatment applications, where particulate matter can interfere with neutralization and chemical treatment. 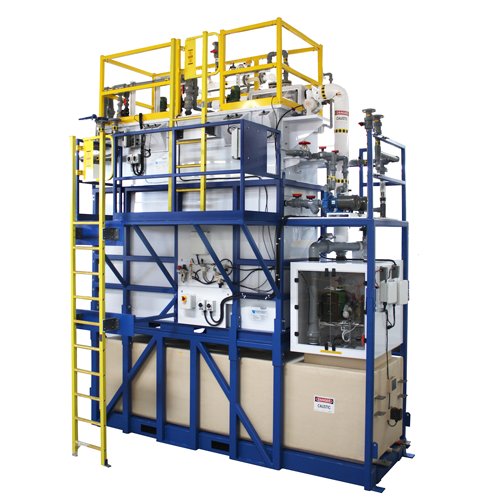 Adding a Wastech Filtration Skid to the process offers an automated solution to complex waste streams. Filtration and strainers can include ceramic filter elements, cellulose, plastic and cloth elements, cartridge and bag designs, mesh screens, or indexed paper filter beds. A variety of housings and filter vessels are available in all sizes made of steel and plastic. For corrosive liquids, the filter media can be compatible with the acid or caustic. Ceramic membranes are available in pore sizes from 5.0 to 0.2 micron. These systems offer automatic controls and back-pulsing that provide low maintenance, reduced frequency of chemical cleanings and excellent compatibility with high purity liquids. Nothing is given off to the liquid being filtered. These ceramic systems compete with RO systems or can compliment an RO system as a pre-filter. Periodic CIP cleaning can be accomplished with chemical agents, steam or heat without affecting the ceramic membranes. Intelligent controls allow infrequent operator attention with excellent durability and cost performance. Polypropylene cartridges are also available in many sizes for acid applications. They offer consistent performance, high holding capacity, excellent chemical resistance and long on-stream life. They work with viscous liquids or high differential pressures. 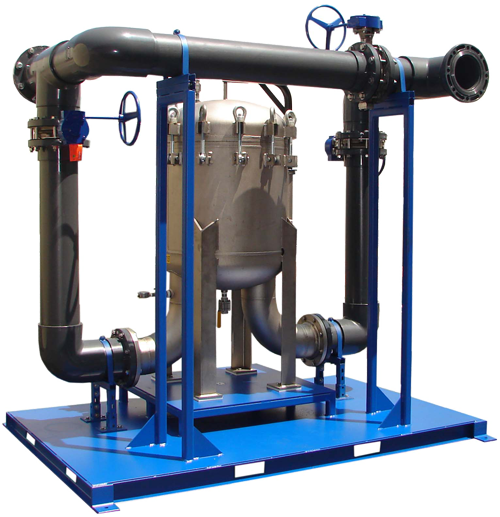 Skid-mounted systems can include tanks, valving, instrumentation, pumps, pulse dampeners, piping manifolds and complete control panels. The skids can be powder-coated metal or fabricated polypropylene platforms. The footprint is small, and the installation is fast and quick.